The Nain Rouge is a small child-like creature that is sometimes described as a dwarf or a gnome and is seen as a bad omen in Detroit, USA. ‘Nain Rogue’ can be translated roughly to ‘red dwarf’ or ‘red gnome’ in French and witnesses in Detroit often report seeing this elusive creature before disasters. 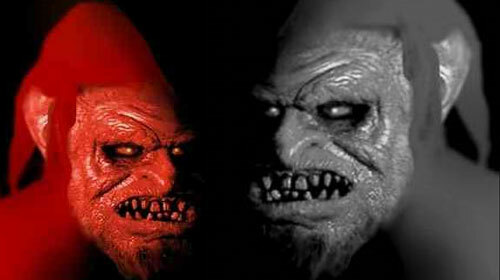 In France the Nain Rouge is referred to more as mythical creature similar to a goblin or leprechaun. The origin of the Nain Rouge in Detroit can be traced back to the very first western settler of Detroit, Antoine de la Mothe Cadillac back in 1701 who is said to have attacked the Nain Rouge upon sight which resulted in a chain of unfortunate events to fall upon him. Since this first account the Nain Rouge has been associated with many disaster up to present day. Descriptions of the Nain Rouge are vague but most run the common theme of a small man or child-like figure with fur boots that can be either red or black, protruding rotten teeth and intense red eyes. Numerous reports have stated that the Nain Rouge emits a sound similar to that of a crow cawing, usually accompanied with a maniacal grin. Have you seen the Nain Rouge? Antoine de la Mothe Cadillac is not the only person to have suffered at the hand of the Nain Rouge. Throughout Detroit history the Nain Rouge has appeared to precede numerous disasters, one well known example of this is the Battle of Bloody Run where 58 British soldiers were massacred by the Native American Pontiac tribe. After the massacre the Detroit river literally ran red with blood for days, however the most chilling detail in this story is that the Nain Rouge was reported dancing by the Detroit riverside the night before the massacre. Another famous account of a Nain Rouge sighting was that the Nain Rouge was seen wandering through the fog not long before William Hull surrendered Fort Detroit over to the British in 1812. The Nain Rouge was also reported numerous times in the days leading up to the great fire of Detroit. It is easy to discredit something such as the Nain Rouge as fear mongering and it would definitely be an extremely hard task to try and prove the existence of the Nain Rouge, especially if the reported sightings are true and this enigmatic creature does some how preempt the disastrous events. If this truly is the case and and the Nain Rouge really is a bad omen then consider this; have these events been bad for all people or just a select group? American soldiers? the population of Detroit? British soldiers? Does the Nain Rouge’s allegiance change? or is it simply a messenger? is the Nain Rouge even real? Its doubtful anyone will ever know. that is so fake because if it was real they would have it in captivity! r we supposed to believe this?